Greek Cypriots are by nature generous and hospitable people. It is a culture thing, and the further away you get from the hustle and bustle of the big cities the more obvious this trait becomes. Cypriots are proud of their traditions, and it doesn’t matter how old you are, or where you have travelled or lived in the world, the traditions you grew up with, stays with you forever. A lot of the traditions are celebrated on religious holidays and seasonal festivals. 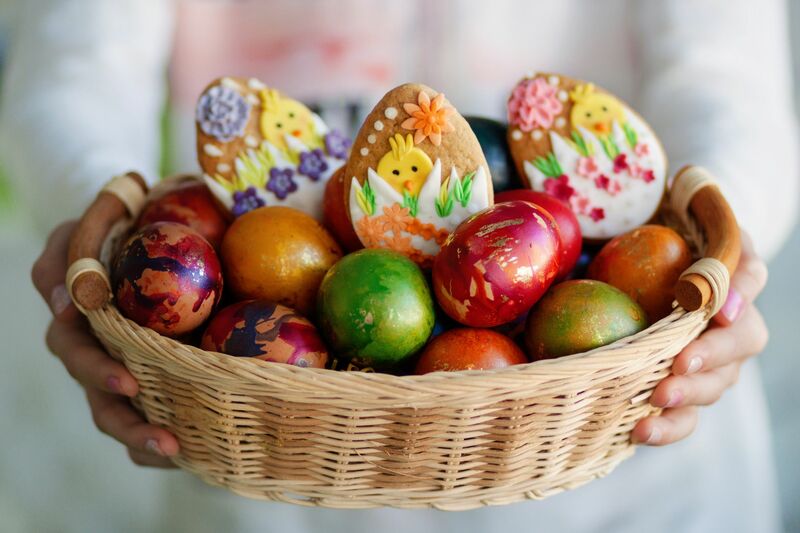 The biggest festival on the Greek Orthodox calendar, Easter is taken very seriously in Cyprus. Not many follow the tradition of fasting for 50 days before Easter, but most will fast for a couple of weeks in order to be able to take communion on Easter Saturday. Traditions that have been followed for centuries by the Greek Cypriots are the making of the famous ‘Flaounes’ which are cheese filled pastries. Almost every home makes these together with the dyed red eggs and the Avgolemono Soup with boiled chicken that is eaten on Easter Saturday, after midnight on their return from church following the resurrection of Christ. Easter Sundays is celebrated in style with huge family lunches of whole lamb on the spit and music and dancing. Greek Orthodox Cypriots celebrate the birth of Christ on the 25th December unlike the Russians who consider Christmas 2 weeks later due to the use of the Julian calendar. All over Cyprus you can hear the children singing Christmas Carols and many traditional sweets are baked, like kourabiedes which are gorgeous shortbread biscuits and melomakarouna the honey and almond biscuits. Families are brought together from all over the island and Christmas lunch is celebrated with a feast that the whole family has helped to cook. In the old days presents were exchanged on the 1st January which is St. Vasilis day, but due to modern times and world trends most people do this on Christmas Day. On New Year’s Eve the Cypriots make a traditional Vasilopita which is an orange flavored cake in which they place a small coin. The cake is cut in exactly the right amount of pieces for those that are present and whoever finds the coin is considered to be lucky in the New Year. On the 6th January, the eve of the Russian Christmas, Greek Cypriots celebrate the Epiphany, on this day children visit their grandparents and read traditional greetings. At the beginning of June every year the festival of Kataklismos or the Water Festival is celebrated. This results in a long weekend and it is celebrated 50 days after the Greek Orthodox Easter. Although this is a religious holiday, in Cyprus it is also organized in honor of the gods Aphrodite and Adonis. Water is the highlight of this festival and all over Cyprus you will note many events taking place. If you are in Cyprus on this holiday and decide to go to these celebrations, prepare to get wet!! The origin of the carnival dates back to ancient Greece and it is said that carnivals were organize in honor of the Greek god Dionysus. In more recent times Apokries which means ‘without meat’ in Greek, marked the beginning of fasting for Easter. All towns celebrate with parades and everyone especially the children enjoy dressing up in colorful costumes and masks. Limassol is well known for holding the most spectacular carnival celebrations on the island. Green Monday "Kathara Deftera" is another public holiday were the Greek Cypriots celebrate the start of the 50 days fast before Easter. Families get together and usually organize picnics in the beautiful forests or on the beach were they eat only vegetarian dishes. Traditionally on this day you will see hundreds of kites being flown with competitions and games which the children absolutely love. This is also the mark of the beginning of spring and the end of winter. Apart from the worldwide celebration of Workers Day, the Cypriots also celebrate the start of spring and you will note that many homes will be decorated with blossoms and seasonal flowers. Wreaths are usually hung on the front door signaling the end of winter and the beginning of summer. The wine festival has been held from ancient times in honor of Dionysus who was the god of Wine and Aphrodite or Venus the goddess of love. From 1961 the Wine Festival has been celebrated in Limassol in the Municipal Gardens and people flock from all over the island to enjoy traditional Cypriot food and the excellent Cypriot wines. You can watch the traditional dances and songs and the theatrical performances that take place and visit the many exhibits of traditional wine making. The best part is that the wine is free – so enjoy! These are the main big festivities in the Greek Cypriot calendar. This does not mean that there are no other celebrations, the Greeks look for any excuse to have a party. Name days are celebrated throughout the island. These are days when named Patron Saints are celebrated, whoever has the same name accepts visitors at home for drinks. Gifts of flowers and plants are usually taken and you will note that big name days like Apostolos Andreas which is celebrated on the 30th November will see many homes holding some sort of celebrations. Birthdays are not as important as name days in Cyprus. As many churches are named after the Patron Saints, they also have big celebrations in honor of these saints on the day, with street vendors setting up a ‘panigiri’ which is a local market were they sell local delicacies. With all these events taking place throughout the year you will surely be invited to participate. The whole month of August is considered a holiday, and you will note that many Cypriots will be going on trips because most businesses are closed especially in the construction and industrial sectors. Schools are closed from the end of June until the middle of September, so everyone considers that August is the month to do absolutely nothing! You will be hard pressed to get anyone to do anything, and apart from the hospitality and retail businesses everything else comes to a standstill.